Qualified in Oxford. Trained in Cardiology in London and Oxford. 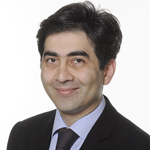 Appointed Consultant Cardiologist in Oxford specialising in cardiac imaging (nuclear, CT & echocardiography) in 2009. Author of various peer reviewed papers in Nuclear Cardiology and Echocardiography, as well as Oxford Specialist Handbooks in Nuclear Cardiology and Valvular Heart disease.